Discover what makes DB’s Atroz trail bike so unique. 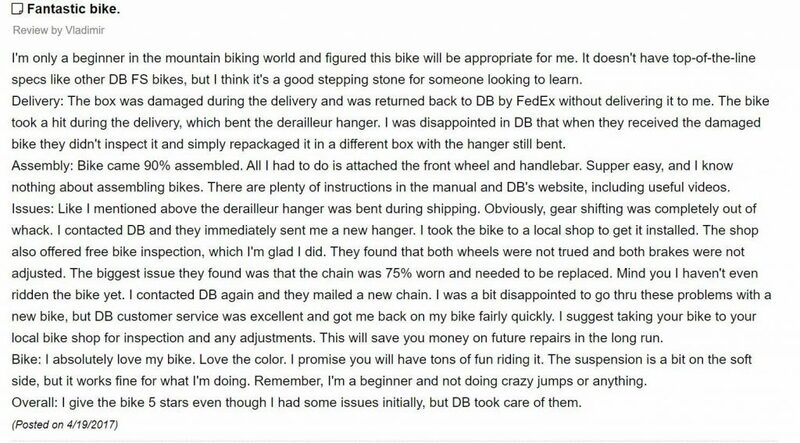 Looking for an honest Diamondback Atroz review? You want a great bike for a great price. The Atroz is a respected bike, and when it comes to brand recognition, Diamondback is a name that everyone in the bicycling community instantly recognizes. The company has long been a favorite among biking enthusiasts, because of their ability to build quality bikes at a price that is hard to beat. Of all the bikes they make, the Diamondback Atroz is worth a closer look. In fact, my review below will be inspecting the Diamondback Atroz so closely that it will help you decide if the bike is right for you. From specs to features and everything in between, we’ll consider every detail. Now then, let’s get to it. If you’re in a hurry and just want to see the best price for the DB Atroz, we got you covered! 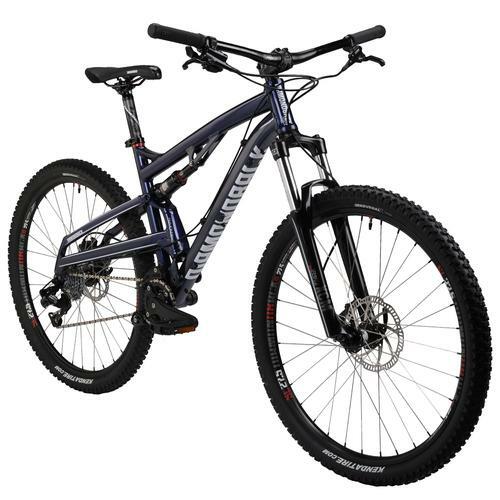 Click here to see the best price for Diamondback’s Full Suspension Atroz Mountain Bike. 1.2 What is the Diamondback Atroz? 1.4 What is it Best For? Remember that whereas one bike may seem perfect for someone else, it does not mean it is perfect for you, so read this Diamondback Atroz review to make your own decision. If you are looking to purchase an affordable mountain bike, you should first consider the size of your budget. Even an entry-level mountain bike does not come cheap. You want to make sure you do not dump all your funds into just the bike. After purchasing your mountain bike, you will need to purchase appropriate safety gear, such as a helmet. You may even need new bike shoes and other accessories. A budget-friendly mountain bike is a fantastic choice for someone who is currently watching their spending. Mountain bikes can easily exceed $1,000, so someone looking at cheaper bikes (but still good quality) typically wants to spend under that. If you want to get into mountain biking but you feel spending more than a grand is too much, a cost-friendly mountain bike might be just the thing for you. If the price is not a factor for you, you may find that a more expensive mountain bike suits your better. Most importantly, if you are pro rider rather than a beginner, you might want to consider one of the higher priced models such as the Diamondback Catch 2. Many professional riders want to enjoy all the bells and whistles they possibly can, which they will easily find on an expensive mountain bike. What is the Diamondback Atroz? Diamondback’s FS Atroz is beautiful in its simplicity. The Diamondback Atroz is a full-suspension mountain bike that provides a sense of beauty and simplicity. The simple, reliable frame combined with the suspension offers a smooth ride over rocks, roots, and any other terrain. Rather than your body absorbing the impact, the bike frame does it for you. Although the Atroz is not new to the scene, the 2017 model improves upon itself from previous models. The company outfitted the bike with knobby tires, a powerful drivetrain to improve speed, and full-body suspension to support the roughest or rides. Overall, the Diamondback Atroz is a fantastic choice for beginners looking to take to the trails and enjoy a smooth, comfortable biking experience. Weight: Varies based on size and body purchased, but typically weighs around 45 lbs. The specs of the bike support its stability and ability to handle mountain trails and other less frequently traveled pathways. The full-suspension frame ensures your comfort and minimizes any aches and pains you might otherwise feel from shock absorption. The Diamondback Atroz is best used for gravel roads, mountain trails, and any other areas where you might find rough terrain. In fact, the bike offers a specific build to make those rough rides as smooth as possible. The suspension manages to smooth out bumps, rocks, gravel, roots, and any other rough ground surfaces you might come across. Despite any drawbacks, the Diamondback Atroz is a high-quality bike that delivers as promised to new mountain bikers looking for a good entry-level bike. The Diamondback Atroz offers a range of benefits that you are sure to enjoy. Familiarizing yourself with the features and benefits of the bike can help you determine if it is the right bike for you. When looking for an entry-level bike, you should make sure you choose something that will accommodate the features and benefits you want and need from a bike. The fact that you have different sizing options is a huge plus. You are not forced to choose a bike that might be too large or too small for you. Instead, you can choose a pick that best suits your height, weight, and body build. The worst thing you can do is own a mountain bike that is either too large or too small. If the bike is not the right size for you, it can compromise your posture. If you compromise your posture, you cannot pedal correctly, which makes the sizing options on this bike an excellent feature and benefit. The best thing to remember is that there is no such thing as a one-size-fits-all bike. Someone who is under 5’10” should not ride a bike belonging to someone who is over 6’ and vice-versa. A bike must offer the right size for your height, weight, and build to provide a comfortable ride. If the bike is the wrong size, you will find that it is too difficult to control. To control a bike the right way, you must have the proper posture, which is something you can only achieve when choosing a bike that is the right size for you. Although the company produced the bike with basic components, that does not mean that it lacks durability. Just the opposite, in fact, thanks to the strong and reliable aluminum frame. Although the material is lightweight, it is strong enough to withstand the most adverse conditions. The aluminum frame supports you on the roughest or rides with a lasting strength and durability that you would want and need from a mountain bike. Do not let the basic components fool you as this bike is anything but basic. In fact, the Atroz was made with longevity in mind. In truth, a mountain bike takes a lot of abuse; far more than a street bike or even a trick bike. Therefore, you need a mountain bike that provides durability. If the bike lacks durability, you will find yourself spending more time in the bike shop performing repairs than you will enjoying your local mountain trails. 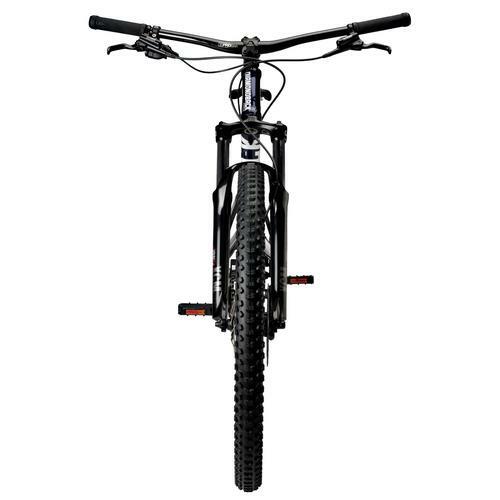 The bike’s suspension eases you into mountain biking by minimizing the roughness of the ride. If you were ever the type of child to dare devil your bike through some off-road pass, you probably felt every bump, grind, and groove along the way. Likely, you didn’t care much about those bumps and grooves, either. As an adult, however, the bumps, grinds, and grooves can lead to unnecessary discomfort and body aches. Fortunately, the full-body suspension absorbs the impact of your ride so that you enjoy the smoothness of it rather than the abuse your body might otherwise endure. There are plenty of mountain bicyclists who prefer a leisurely ride across rough terrain at a slow, steady pace. However, there are also many who prefer to challenge nature as much as themselves by enjoying an intense, fast-paced ride. Fortunately, the Diamondback Atroz allows you to do just that thanks to the SRAM 9-speed drivetrain. Put it in gear and get ready to tackle some gnarly trails. Thanks to the wide range of gears it offers, you can traverse over different terrain types with both ease and speed. Push yourself and discover what you’re made of as you power your way through the twists and turns of your local off-road trails. You will find that the Atroz drivetrain has no problem keeping up with whatever you throw its way. The Diamondback Atroz is unique for several reasons. Enjoying the uniqueness of the bike, of course, is only half the fun. Understanding everything the bike offers and then taking the time to ride it will adequately prove that it is product deserving of consideration for purchase. The Atroz offers a unique style that gives it a nice, classic mountain bike look, yet it has plenty of modern features. Despite its modernity, it sufficiently pays homage to its predecessors by maintaining a bold, sturdy appearance that mountain biking enthusiasts enjoy. Even though it is a budget-friendly mountain bike available at an affordable price, the Atroz packs plenty of great features. Finding a bike that travels as quickly as this one does on flat ground and up steep slopes while providing an affordable price tag is no easy task. Often you will have to sacrifice great features to find a bike that you can afford, and that is not the case with the Diamondback Atroz. Since you are considering the purchase of a budget-minded mountain bike, it is safe to assume that price is a crucial factor for you. 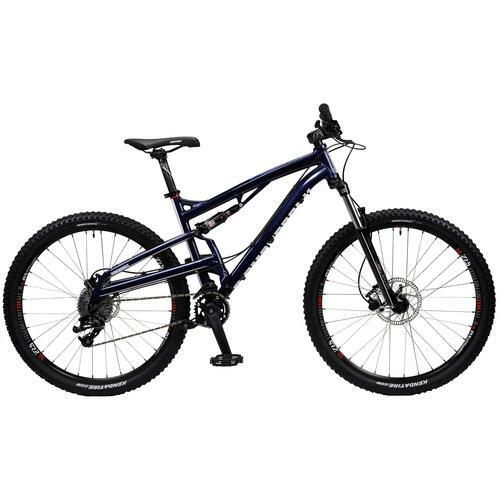 Whereas many mountain bikes cost upwards of $1,000 or more, the Diamondback Atroz is available for $819.99. In truth, a full suspension mountain bike under $1,000 is a hard find, which makes this bike a great deal for beginners on a budget. In addition to our own review, we searched the internet for consumer reviews and found that other users feel the Atroz is a fantastic choice. Nearly every mountain biker fell in love with it with little to no complaints. Almost everyone seemed to agree that it is an excellent bike with plenty of incredible features for the price. Diamondback Overdrive Comp 29er: There are certain differences between the Diamondback Overdrive Comp 29er and the Diamondback Atroz, such as the differences in wheel size and drivetrain. The Overdrive Comp 29er comes with a Shimano Deore 2×10 drivetrain compared to the Atroz’s Shimano 9-speed drivetrain. Also, the Overdrive Comp 29er sports larger Kenda Honey Badger tires at 29 inches rather than 27.5 inches. Like the Atroz, the Overdrive Comp 29er does offer front and rear support for a smoother ride. However, the Overdrive Comp 29er is more for people who plan on taking thrilling rides through dirt, mud, rain, and other adverse conditions. Click or tap here to learn more about the Diamondback Overdrive Comp 29er. Diamondback Apex Elite: The Diamondback Apex Elite is another great alternative with its hydraulic lockout and customized hydraulic brakes. The hydraulic brakes sport a mix of Shimano, Deore, Acerea, and Alivio to improve its ability to withstand wet, rainy conditions, much like the Overdrive Comp 29er. Like the Atroz, the Apex Elite sports a lightweight aluminum frame to help improve maneuverability and control. When riding a mountain bike, you should never feel as though the bike weighs you down. Thanks to the aluminum frame, you won’t ever feel that way. Click or tap here to learn more about the Diamondback Apex Elite. Diamondback Overdrive Pro 29er: The Overdrive Pro 29er differs from the Atroz in that it offers a Shimano 2×10 drive train compared to the Shimano 9-speed drivetrain. Also, the Overdrive Pro 29er weighs less, at just 28 pounds. The bike sports larger wheels at 29 inches in size, making it a formidable contender when rolling over rocks, ruts, grooves, and tree roots. Hydraulic disc brakes allow you to stop the bike quick when necessary to help keep you safe and sound. Like the Atroz, the Overdrive Pro 29er offers a comfortable ride thanks to the shock absorbing suspension that it features. Click or tap here to learn more about the Diamondback Overdrive Pro 29er. The Diamondback Atroz is a budget-friendly top choice. Deciding to purchase a budget-minded mountain bike is never easy for anyone. There are so many bikes to choose from that you might feel as though your head is spinning. How do you possibly sort out all the specs and features to determine which one is better than the other? Well, we know exactly what it feels like to be confused during the research process of buying a new trail bike. That’s why we did the legwork for you and created this Diamondback Atroz review. And we’re happy to say that, all-in-all, the Diamondback Atroz is an excellent choice for you if you’re seeking a budget-friendly mountain bike. Considering that you can buy it for under $1,000 with all the splendid features it boasts, makes it a fantastic option. Even more important is the fact that the Atroz provides several of the specs, benefits, and features that mountain bikers look for in a high-quality mountain bike. Don’t let the fact that it is an entry-level bike fool you, either. The features and specs of the bike make it a mountain trail worthy choice. Click Here To See The Diamondback Atroz Mountain Bike.